ALBANY, NY- 4/27/17 – The Preservation League of New York State has selected the Argos Inn in Ithaca to receive an award for Excellence in Historic Preservation. John Snyder Architects worked extensively with the Owner Avi Smith from 2009 through the completion in 2013. All damaged or deteriorated exterior features were sensitively repaired during the rehabilitation. The overgrown ivy was carefully removed to prevent further damage to the nearly 200 year old brick and failing paint was scraped and new paint applied. Other deteriorated exterior features like the south porch’s “Llenroc” (Cornell spelled backwards) limestone treads and sidewalls, wood windows, decorative trim, and metal roof were repaired or replaced in-kind. The most striking improvement to the exterior was the rehabilitation of the enclosed two-story, east porch, which had been insensitively infilled with small casement windows and large expanses of clapboard between 1970 and 1980. This infill was removed and large, floor-to-ceiling panels of insulated glass were installed behind the original balustrade and columns. The transparency of the new glazed enclosure restored the historic open appearance of the porch while providing crucial interior space. 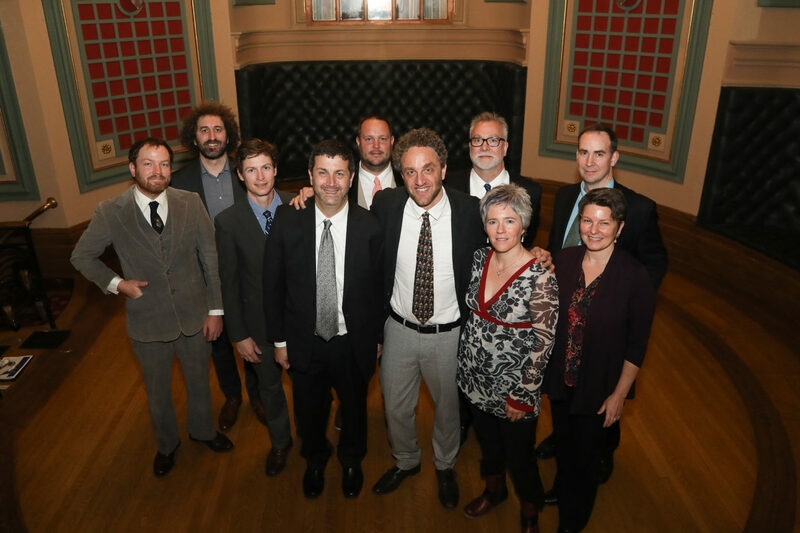 The Project team (pictured) attended the Preservation League’s Award Ceremony in New York City at the historic New York Yacht Club, 37 West 44th Street.